While most reviews found on this site will focus on downtown locations, an exception was made for this West side adventure. This decision was based on the recommendation of a friend of mine, and like most things in life… she was right. So, now that props have been given, down to the nitty gritty. 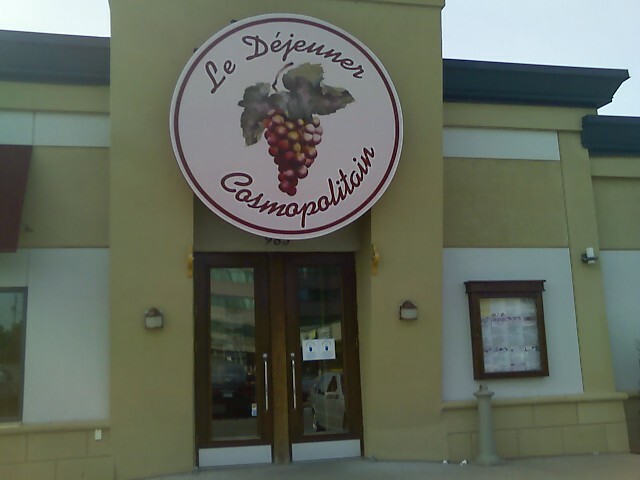 Situated in Pointe-Claire, Déjeuner Cosmopolitain (not to be mistaken with its sister Laval location) welcomes you into what can best be described as a breakfast bonanza. Its menu reads like a grocery list with choices bound to please all who visit. Right from the beginning I noticed that Cosmopolitain is wheelchair accessible, including wheelchair friendly restroom stalls. They even have a room set aside for small events if people wish to book it. On the culinary side they have a variety of vegetarian options: there are halal and Kosher potatoes available where they are cooked separately in their own oil and segregated from the other food (if you are vegetarian make sure to specify this as or else there will be meat traces in your potatoes). 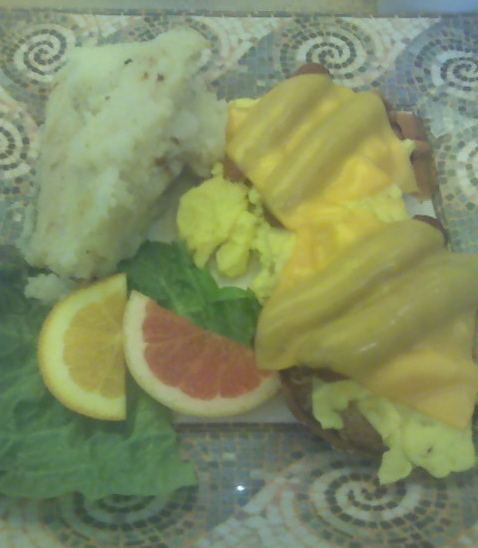 They also tout the use of omega-3 eggs and over 10 different kinds of breads from Cantors bakery. This attention to detail makes for a healthy and different brunch experience. Cosmopolitain has quite a few dishes worth checking out. 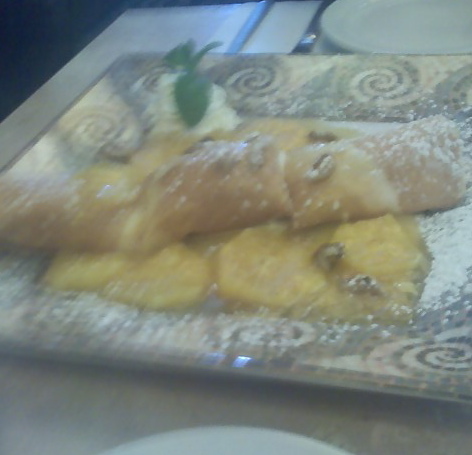 The crêpe Suzettes are light and delicious, and make you want to order a second helping. 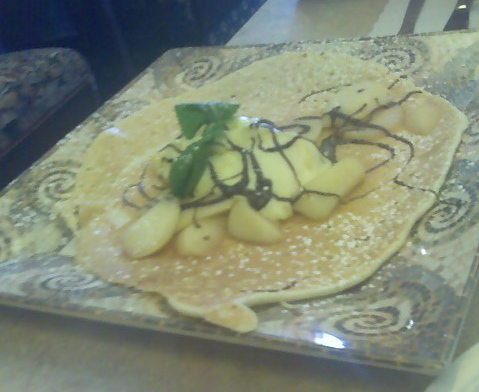 The Flambé crêpe selection is quite solid, but a particular stand out is the Flambé pear dish, which is to die for. 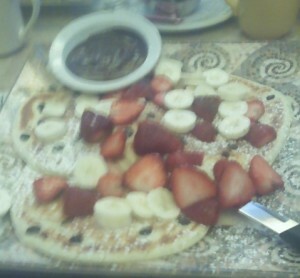 The Cosmo Royal Pancake is a monumental collection of chocolate chips, bananas, strawberries and chocolate hazelnut sauce (which I suspect may be Nutella).The portions of all the dishes are quite generous and you can even bring some home with you. Although the portions are enormous, the plain waffles and pancakes are a weak point so if you’re in the mood for them get the really fancy ones. The coffee is a bottomless cup which they come by to refill quite often. The service is pleasant and welcoming, the staff is always warm, friendly, and service is prompt. They had my favourite waitress working there, this red headed firecracker who was 110% fun and awesome and even though she no longer works there, the the service still remains good. For a brief period of time they tried live music with someone going around from table to table, and while I have not witnessed this my spies do confirm it. Fortunately, since live music floating from table to table is never a good thing I’m happy that they got rid of it. Cosmopolitain does offer some vegetarian options. 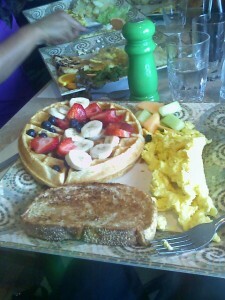 They have a wide array of omelets, pancakes and waffles (please see image of Déjeuner Santé below). They even have vegetarian potatoes, meaning that they are not cooked with animal bi-product(s). Although if you are a vegetarian you will need to specify that in your request, especially for the potatoes since the non vegetarian ones are the default in all plates. Another thing to keep an eye out for is that some plates come with a side of meat product, like cretons, which is not always mentioned in the menu, so be particular when you place your order to avoid any disappointment. On the whole, they do have more vegetarian friendly options than most other breakfast places. Overall, Cosmopolitain is a surefire hit and well worth the drive to the West Island. The prices are fair, portions large and the menu has much to offer. Parking is abundant and the lines are thankfully short to the point where you will likely only wait 5 minutes for a group of 3-4 people at peak times. The only down side is that if you don’t drive it will be very difficult to get to the West Island, so find someone with a car and enjoy this walk on the West side… Remember W is for Welcoming. Thank you for the review Bert. 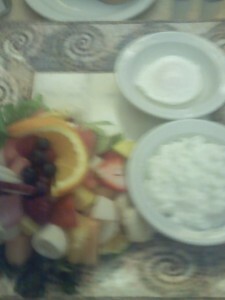 You details are very much appreciated as I love breakfast dessert. I also really appreciate the pictures as they look genuine and gives an idea of portion sizes. I look forward to more of your reviews! The pancakes were deliciouschild not a child friendly place. Service slow and service not friendly.